Two 30 minute lightning delays, torrential rain and freezing temperatures could not deter the Longhorns from defeating the visiting Screaming Eagles last night by a score of 7 -6. 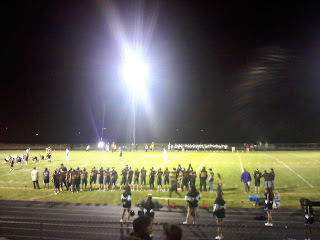 Wow - is high school football exciting. I apologize to any high school football players and parents who think I am being a tiny bit sarcastic. Perhaps, it can be attributed to the four hours I spent in the cold last night. Perhaps, I could have dressed warmer – although I had hoped my ski jacket would have been enough. Or, perhaps I am busy every Friday night for the foreseeable future - and unable to go to anymore football games this season. But I digress - this is about Alex - not my discomfort. When we arrived at the game, we were handed a program with all the players’ names including the Manager's – my sweet daughter. I was so happy she was included in the program. Not only for her own pride – but for those other parents who wondered what the heck a non football family was doing at the football game in this weather. Okay – I digress again…Alex, as the Manager, is responsible for removing the tee after kick-offs and standing on the side lines with the players to see if they need water or gatorade. She wears a jersey and normally she would be difficult to spot from the bleachers – but yesterday she was the only one on the field wearing her ski jacket. I found her pretty quickly and was able to pay close attention to her actions. I noticed that when a four year old kid tried to beat her to the tee, she let him – I would have too - it was cold. When the team called time out and she was supposed to take the drinks in the field – she didn’t argue when some middle school kids did it instead – I would have too. We often think that Alex may be the only person we know who has actual common sense. I will add, she was also the only person in the entire area, who was warm. Alex did not take her jacket off until the game was over. It was time for the high five line-up with the Screaming Eagles. I know, she knew, it was not cool to be wearing her jacket for this part. So as I watched all the players line-up to high five, I saw our daughter, number 64, right in the middle, high fiving away. I knew it was a good evening. Alex came off the field happy and feeling like part of a team. It is so important for all kids to feel they are part of something - whether it is a team, a club or any other group- the self esteem that comes with this is huge. I am so thankful for these opportunities in Alex’s life. We came off the field cold and wet, but proud. Maybe it was worth the discomfort to see Alex so happy. And maybe I am not so busy after all, for the next home game in two weeks. Number 64 – you had an awesome game!